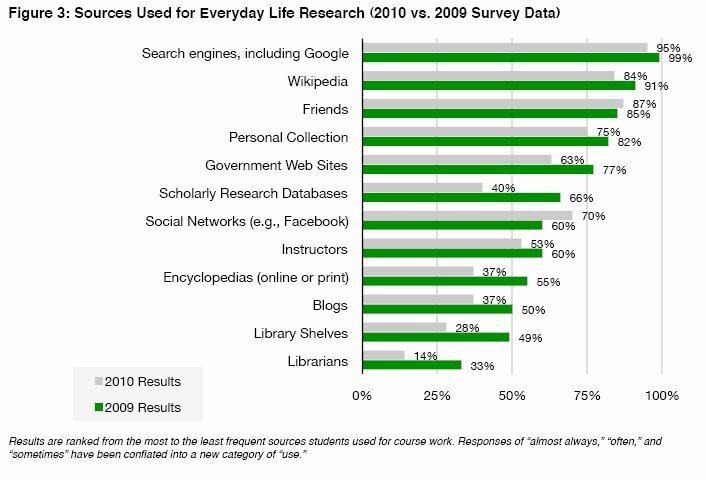 Higher Ed, the Google, and the Wikipedia | Ketuvim: the Writings of James R. Getz Jr.
How do students evaluate information and use it once they have found it? What difficulties do students encounter with research for courses and for personal use from start to finish? Read PIL’s “Truth Be Told: How College Students Evaluate and Use Information in the Digital Age” with findings from 8,353 college students from 25 colleges and universities in the U.S. Watch the preview video (3:05) and read the report (72 pages, 5.8 MB). Basically, students are almost twice as likely to hit Google than talk to an instructor about research and are almost seven times more likely to hit Google than to talk to a librarian. The number concerning Wikipedia are almost the same. Pretty wild, but important to realize.